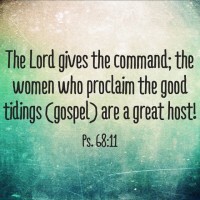 This page is devoted to the daughters of the Most High. You have a unique and powerful role to play in the life of your husband, children, the assembly, and the world. My hope is to encourage you, renew your spirit, and refresh your outlook on the fact that the Creator chose you to be an Ezer Kenegdo and an Eshet Chayil. Parts I-III of this series were inspired by the great insight of Dr. Skip Moen and his book Guardian Angel: What you must know about God’s design for women. I will be ever grateful to Dr. Moen for helping me to find the missing pieces to the puzzle of the biblical role of women. Dr. Hollisa Alewine’s Creation Gospel (particularly workbook four) has been equally, if not more impactful, in inspiring me to continue with the rest of this series. Matthew Vander Els: PAUL: Should Women Teach? 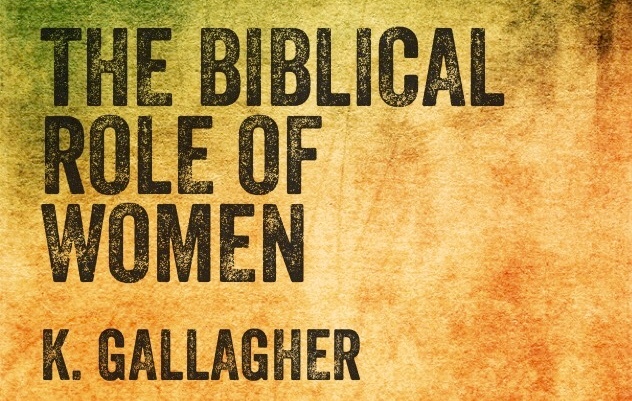 I have started reading through your series, The Biblical Role of Women. Thank you for sharing your studies and insights! Oh that many, many more women would read your series! I’ve sent links to the study to some of my friends, hoping they too will be encouraged. I have such a burden for the daughters of the King. I’m glad you are sharing it with even more of them. (Thank you) I really want us to “get” the awesome role and function we were created to fulfill. By the way, I love your blog also (http://coldwaterstoathirstysoul.wordpress.com/). Your latest post “Where the Tree Falls” really hit home with me. Have you ever studied the Creation Gospel by Dr. Hollisa Alewine? She takes you through quite a bit of biblical imagery involving trees. You brought even more life to that imagery! The Ruach is truly amazing.  Keep writing and sharing with us! I’m speechless over your kind words. Thank you so very much! Your blog is rich with insight, and I’m slowly taking it in. Thank you for all your time and study into bringing forth Father’s truths, that have been hidden in plain sight! I’ve also sent links of the articles to a few of the men in my family. lol They are scratching their heads. But once they read this series, I’m sure they’ll be glad! This study is excellent. In my own studies, I have been drawn to learn how men and women can live in unity in the Church. I’ve have never seen such a resource that ties all these points together. So thank you!!! I am very encouraged. On a different note, how do you approach women who are not natural nurturers, or do not possess typical “feminine” qualities (excelling in organization, communication, homemaking, multitasking etc.) but rather a more “masculine” approach to life? As to your question, my posts on the Biblical Role of Women are painted with very broad brush strokes. They are the general rule (I believe), but as you know, we are still each very much individuals as well. Regardless of gender, there are many facets that affect our natural strengths and weaknesses. Our personalities, temperaments, and even whether we are strong right or left brained in thinking contributes much to our calling, gifts, talents, and field of work. I don’t believe this is because they are more “masculine” per se, but that the Creator sovereignly chose to give them a gift He more often gives to males. I believe that every female is at her core an ezer kenegdo and a natural guardian of boundaries even if she’s an engineer. Thus, though she might “appear” to have more masculine traits, her approach to everything she does will come from that place of femininity. This is her God given strength even if she’s in a male dominated field or ministry. In such a position (around mostly males), she will be the one that will offer a perspective/solution/approach that is different from her colleagues. Which, I believe, brings balance — particularly in decision making. Moreover, in recent decades, we have seen women excel in nearly all male driven fields, sports, etc. And males excelling in more female oriented work. This is testimony, I believe, of our equality and humanness in general. Nevertheless, there are aspects of our gender that still keeps us unique as women and men. Without which, we wouldn’t have LIFE. Both are so vital to the Creator’s plan and creation being VERY good. It also occurred to me that you may be thinking more about ministry. I believe women are just as capable of fulfilling all the offices of ministry, and that having BOTH males and females in these roles brings balance AND enables the Body of Messiah to reproduce with abundance. (LIFE) The more demanding positons are often filled by males. But like the field of engineering, God in His Sovereignty and Omniscience divinely gives many females the qualities and drive to fulfill these offices also! Like I mentioned above, I don’t believe this is because they are more masculine. On the contrary, I believe their femininity is exactly why He chooses them. So, it may seem like they aren’t the typical woman because they are not. But woman (ezer; eshet chayil) they are nonetheless. I know women that are strong nurturers, homemakers, soccer moms, and multitaskers. And I also know women that are executives, engineers, doctors, etc. The latter group has different strengths than the former, but there is still something deep within them all that is altogether feminine (and by virtue godly). This is longer than I intended, but one last thing: I have plans to write on biblical feminism in the future. I am a part of some communities that support biblical equality, but sadly many of them end up taking their cues from secular feminism and try to make women into men. It’s as if they “think” that being male, thinking male-like, and approaching things from the masculine somehow makes them equal to men. I believe this is an abomination and undermines the very intent and purposes of God making the one adam into male and female. Why an abomination? Because without both sexes, there is no life. (We serve the God of the Living!) The natural principle of how we reproduce should teach us something about spiritual reproduction. (1 Cor. 15:46) I am thrilled to see that women (at least in the west) are having doors in various fields of work and ministry being opened to them. And I’m glad there are many men and women fighting for our equality in all areas. But my prayer is that these good intentions won’t be subverted or perverted by following this huge mistake of secular feminism. We don’t need more women to become men; we need men to be men and women to be women. We need to be One flesh both male and female operating in unity and freedom. Very good reasoning and I, from my knot hole, know that you are right on. To further your stance, I would encourage you to read a book called, “His Brain, Her Brain”, by Walt and Barb Larimore. This book will show you the physical differences between men and women from conception, and then when you see and connect the physical and the spiritual differences, something else will really become clear and make sense. Very fascinating subject – the differences between men and women both physically and spiritually. Together, we have an incredible strength, but this will only happen when we submit to each other’s strengths – … and encourage each other to be strong. Have you read any of books in the Feminine and Free series by Dr. John Garr? He expounds on much of this too. Thanks for taking the time to comment. I (and I’m sure my readers) appreciate it. In no way have you scared or offended me 🙂 I love your complete answer and attention to detail. My intention was to see if we should assign the term “masculine” or “feminine” to any task or ability used in ministry (which I consider to be daily life), or whether those descriptions reside within us regardless of our chosen realm of activity. I agree with you that one’s “masculinity” or “femininity” will show up naturally regardless of brain type or preferred area of service. In my adventure with God, I have become very concerned about current teachings in the western Church about the interaction of men and women. Currently, God has made it very clear that I am to research this topic and build up the body with it. It seems we are in a time that is ripe for change and growth. I’m very excited to see what the Lord will do. Thanks for doing the digging for us. It means the world. We need you sis! Thank you so much for writing this (and for finding my blog which led me here)! I am now reading Guardian Angel and I don’t even have the words to explain how incredible it is. I feel like life is suddenly making more sense, haha! Thank you so much for this incredibly eye-opening teaching. I just ordered Guardian Angel for both me and my daughter-in-love. 🙂 I wanted to ask, is there is a Study Guide that goes with the series ” The Biblical Role of Women”? This would make such an amazing study for the women in our assembly. I’m wanting to share this with all the women in my life. Thanks and shalom to you and yours. Thank you for your kind words. I haven’t developed a study guide for the series, but you are free to share it with your group. 🙂 You can also email me with any questions or clarifications. I pray YHWH blesses you all abundantly as you dig into His Word to see His design and purpose for His precious daughters! Thanks for stopping by. It’s always encouraging to hear from my readers. Great teachings…thank you. In studying Yah’s word since 2002, you have confirmed what I have seen personally as I diligently dug for His truth from His word, and also answered so many, many more areas of deeper truths from His word. Praise Yah!! Thank you once again.This is such a needed truth in the body of believers and to the many who are prevented from coming into the body by the letter of man’s doctrines passed down through the ages. I sense a spiritual tsunami gathering depth and height…waiting for that critical eartquake to start the ball rolling. This teaching could be that earthquake. I will be praying for you and His Spirit to start it! Shalom! Thank you so much for your encouraging words! 🙂 The woman is being revealed, and when she is, both men and women are set free — I’m speaking both literally and figuratively here. May Abba continue to bless you as you dig into His Word. Amen! Thank you taking the time to comment. It encourages me to keep pressing forward. I pray Abba abundantly blesses you as you continue to study His Word.